Imperial Art Appreciation: Orange is licensed under a Creative Commons Attribution 3.0 Unported License. Permissions beyond the scope of this license may be available. Posted to Flickr on 04 August 2009. Part of the Stormtroopers series. "Cadets, have you read chapter two of your Art Appreciation text? I hope so because now we’re going to study the color orange." "Who doesn’t love orange? 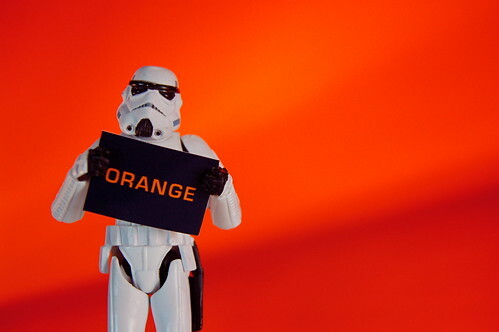 Orange is the color of enthusiasm, of energy, of a "get-things-done" attitude. And orange fruit is delicious!" "But in contrast, orange is also the color of things that are fading, run-down, or ‘past their prime,’ such as sunsets, autumn leaves, or rusted metal. It is for this reason that the weak-minded sandtroopers wear the color orange, because … um … ah … okay … I see the headmaster is motioning me to move on …." Today’s lesson: If you don’t pass this class, you may soon be wearing orange. This photo was posted to Flickr on 04 August 2009. It was one of 500 images featured on Flickr Explore for that day. The last time I checked, it had 26,453 views on Flickr. Imperial Art Appreciation: Orange by JD Hancock is licensed under a Creative Commons Attribution 3.0 Unported License. Permissions beyond the scope of this license may be available.